Screenplay: Rhett Reese, Paul Wernick. Starring: Woody Harrelson, Jesse Eisenberg, Emma Stone, Abigail Breslin, Amber Heard, Derek Graf, Mike White, Bill Murray. Zombie flicks have always had an underlying sense of humour throughout them, which has also made them perfect fodder for an out and out comedy. “Shaun of the Dead” was a British attempt at it and this, in some ways, could be seen as it’s American cousin. A virus has swept the world and turned 99% of the population into ravenous zombies. A few “normal” humans remain, like young Columbus (Jesse Eisenberg), who hooks up with a gun-toting zombie-eradicator named Tallahassee (Woody Harrelson). Their road trip gets detoured when they encounter two savvy sisters Wichita (Emma Stone) and Little Rock (Abigail Breslin) heading for an amusement park in California. 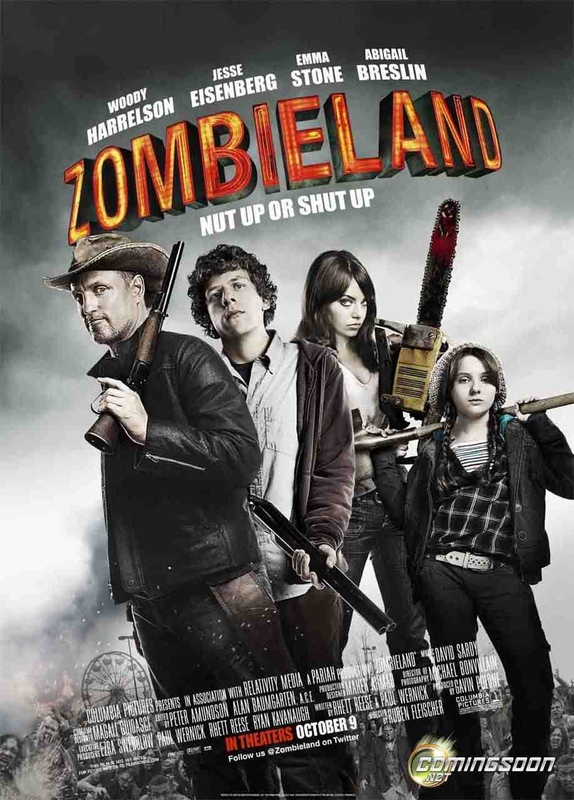 This film had me hooked from the beginning with it’s excellent fun packed introduction complete with Eisenberg’s life saving “rules” to surviving a now over populated world of Zombies and a hilarious slow-motion credit sequence with zombies, of all kinds, chowing down. As it progresses though, it begins to run out of ideas becoming a bit uneventful. This is mainly due to the characters having no real purpose in their lives and are left to just waste time on their travels. As a result it becomes a little stale but the arrival of a cameo appearance by Bill Murray playing himself, lightens up the proceedings and the amusement park finale is pure excitement. A perfect way to see our Zombies friends meet their fate. The four actors all put in good performances. Harrelson gets the juicy role but it’s Eisenberg who really shines, combining comedy with drama effortlessly. It’s good to see that he is getting some choice roles and continues his good streak. Ruben Fleischer does a fantastic job here and is definitely a director to watch. He has a creative and fun-filled visual style that keeps this film going, despite some periodic lulls. 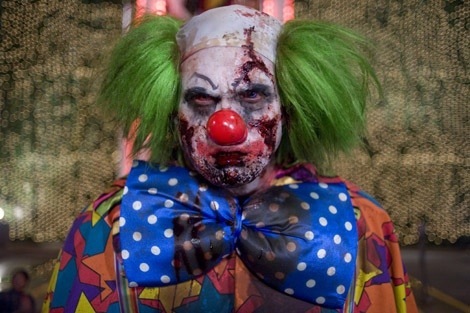 Zombie fans should find plenty of enjoyment and fans of comedy won’t be displeased either. Roll on the sequel. This entry was posted on February 1, 2012 at 9:18 am and is filed under Action, Comedy, Horror with tags 2009. You can follow any responses to this entry through the RSS 2.0 feed. You can leave a response, or trackback from your own site. Hi, I’m trying to get a hold of you to review our film entitled Peelers. I apologize for writing here but cannot find any contact info. Please drop me a line at peelersthefilm@gmail.com. Feel free to remove this comment if you so desire. BTW, our main actresses last name is Walker! Thanks!